I was speaking to the manufacturer of these. 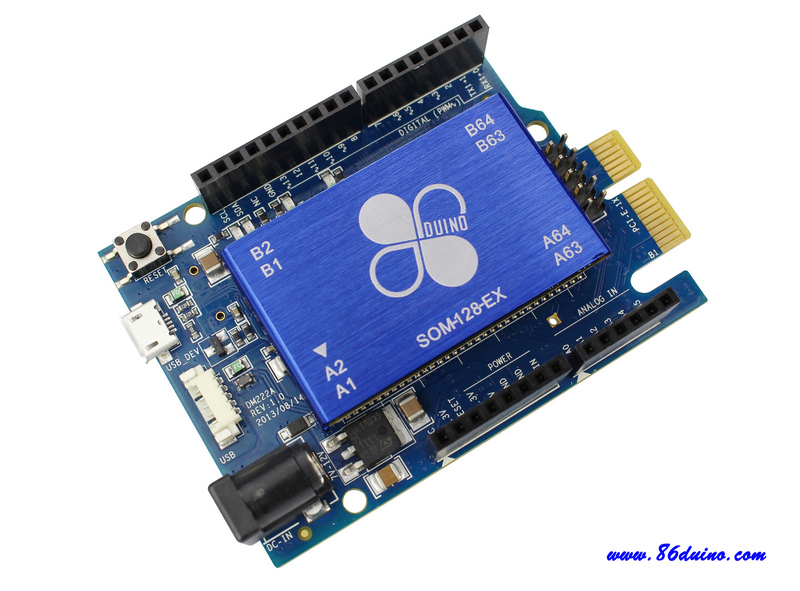 The Arduino is a base for the blue SOM, which they sell separately, and they are bringing out a baseboard for the SOM as well. THe biggest negative about the Arduino format is that it doesn’t bring out the Ethernet feed – the SOM has a MAC & PHY built into it. There actually is a WEC7 BSP for the SOM. Drop them a line and encourage them to do a Compact Embedded 2013 port of their WEC7 BSP! Interesting idea putting a PCIe connector on the unit. Maybe this will be what I hoped the new Intel chip could have been. The Vortex86 CPU has been about for a while, and it’s performance is not phenomenal, but for CE it is probably more than enough. It’s stable at least. To clarify – the Arduino does bring the Ethernet out to a connector on the underside, but it’s awkward having to run a little jumper cable out to an RJ45.